I dont’t have many pet hates, but one of them is my dishes or gym bottles smelling of the product that cleaned them and having residue left on them. Whether it be washing up liquid or dishwasher tablets, I just want my dishes to smell clean and not synthetically floral. Most of the cleaning products in my house are from Method (www.methodproducts.co.uk) or Ecover (www.ecover.com) so it would not take a rocket scientist to work out that I would add Ecover’s Dishwashing Tablets to my cleaning cupboard arsenal. 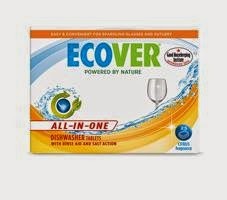 Like most brands Ecover have two varieties of dishwasher tablets, the Classic and All in One. 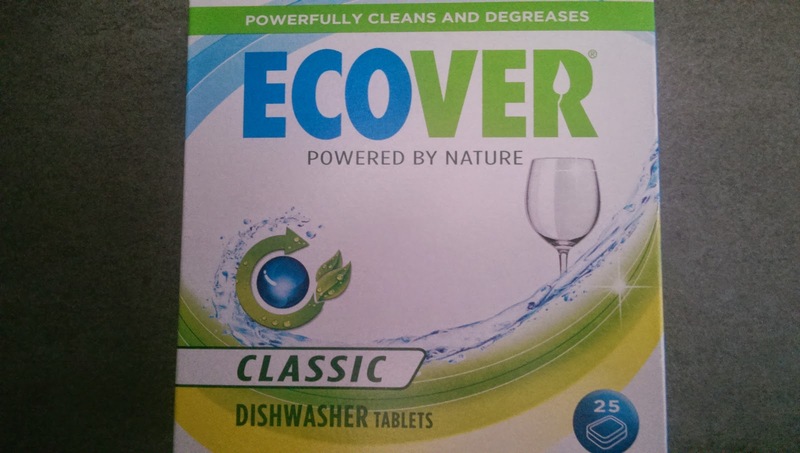 The similarity stops there because unlike most brands, Ecover’s Dishwasher Tablets are not petrochemical based or have any unnecessary chemicals in their ingredients. My first question was would they clean just as well?… Yes. They degrease and clean well. They also have a perfume that is from plant based ingredients and the tablets themselves are biodegradable, have minimum impact on aquatic life, phosphate free, chlorine free, septic tank suitable, the box is 95% from recycled cardboard and the wrappers are 100% recyclable. There were no smears left on my dishes. There were no bits of grit in the glasses and just as important for me, there was no nasty synthetic smell. The main difference between the Classic and All in One is that the later includes rinse aid and salt. I found them both to clean just as well and left no residue on dishes, but the All in One did provide another level of sparkling clean to my glasses. Previous Post Into the Flax zone…. Next Post Moments with Rose……….